Directions: Questions 1 to 3 are based on the following data. Directions: Questions 4 to 5 are based on the following data. Directions: Questions 6 to 10 are based on the following data. 1. If the dollar amount of sales at Store P was $800,000 for 2006, what was the dollar amount of sales at that store for 2008? 2. 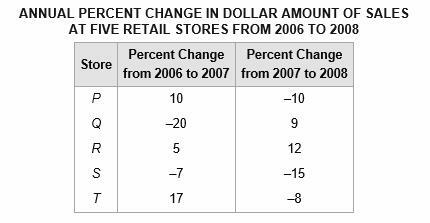 At Store T, the dollar amount of sales for 2007 was what percent of the dollar amount of sales for 2008? Give your answer to the nearest 0.1 percent. 3.Based on the information given, which of the following statements must be true? For 2008 the dollar amount of sales at Store R was greater than that at each of the other four stores. The dollar amount of sales at Store S for 2008 was 22 percent less than that for 2006. The dollar amount of sales at Store R for 2008 was more than 17 percent greater than that for 2006. 4. 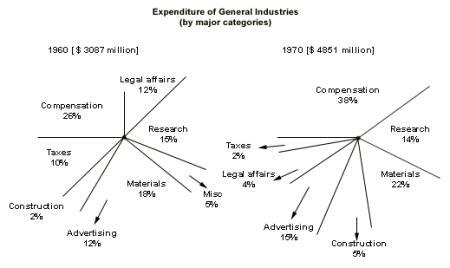 Ratio of the amount spent on legal affairs in 1970 to the amount spent on legal affairs in 1960 approximately. 6. Total number of candidates qualified from all the states together in 1997 is approximately what percentage of the total number of candidates qualified from all the states together in 1998? 7. What is the average candidates who appeared from State Q during the given years? 8. In which of the given years the number of candidates appeared from State P has maximum percentage of qualified candidates? 9. What is the percentage of candidates qualified from State N for all the years together, over the candidates appeared from State N during all the years together? 10. 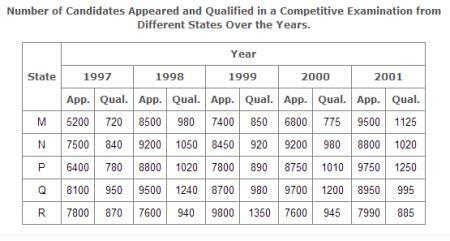 The percentage of total number of qualified candidates to the total number of appeared candidates among all the five states in 1999 is?